Well readers, there goes another month! It was called July, although I’m sure most of you already knew that :) And what a fun month it was, right? I mean… we got to see a kawaiified football, helped out a girl with her holiday blues, and even got to see some prototype novelty goods, twice! 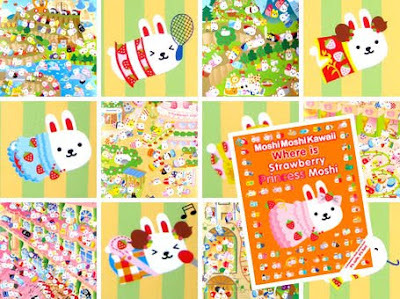 And along the way we meet AAITSKI!, Moshi Moshi Kawaii, and I Look Pretty to name but a few. And, don’t worry, I haven’t forgot about our monthly puzzle. Did you spot the correct photo? Astounding! It was D! Who’d of thought it was possible? Well... pretty much anyone that looked at it really! 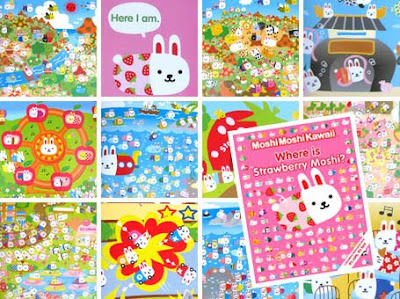 Anyway, be sure to come back next month readers when we’ll have plenty more kawaii treats and goodies for you, including another great puzzle! And… there’s even a rumour going around that we’re going to have some very special papercrafts! Can it possibly be true? There’s only one way to find out! 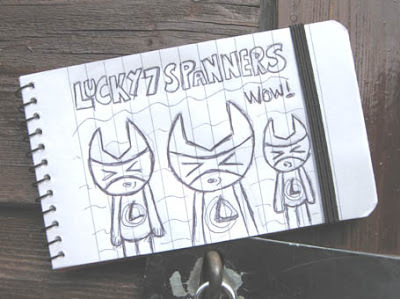 It’s the Lucky 7 Mascot Spanner Set. Stunning, isn’t it? I got the idea for it while staring in disbelief at your bizarrely shaped head - excuse my frankness! And, as before, I’m prepared to offer you a seat at the table for the undoubted riches that this product is sure to reap! And the cost to you for getting this project off the ground? A meagre $3.47 million! Cheap at half the price! Prof. Waldo P Wilkinson. Aged 105. Sorry Waldo, but I’m afraid the only thing I’m going to offer you is belated birthday wishes! Although I have to admit, I do admire your tenacity! Yes, unbelievable but true! It seems that this so called kawaii blog has managed to run for a whole year without mentioning the amazing work of thickblackoutline! 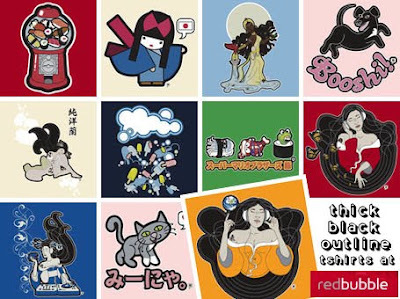 Thickblackoutline is a graphic designer and illustrator who creates astounding vector artworks with a strong oriental influence, and her RedBubble shop is just the place to go and see them. And, thankfully for you, it’s also the place to go if you feel like picking up a thickblackoutline t-shirt! 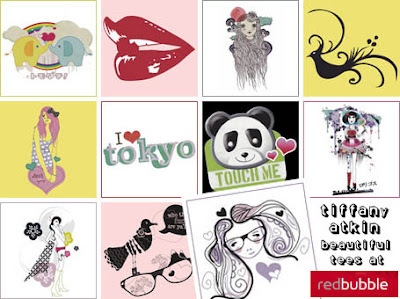 And, after seeing all these great designs, I’m guessing you probably will! Catastrophe! It looks like the photo booth machine has messed up the Money Mascot’s passport photos! What a disaster! Or is it? 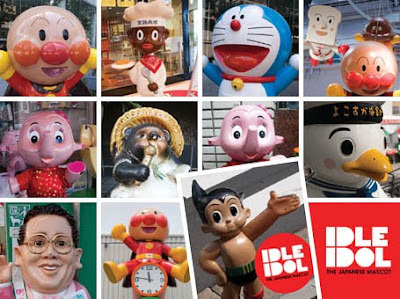 I think I can spot one photo of the Money Mascot that looks OK! In fact, I’m sure I can! 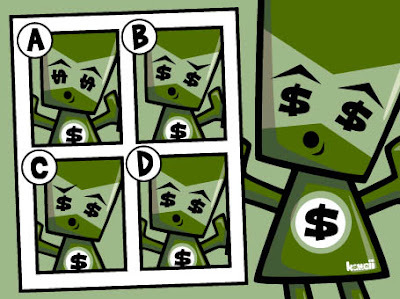 The question is… can you work out which photo is a true likeness of the Money Mascot? Well, can you? The answer, as ever, will be revealed in this month’s monthly round-up! 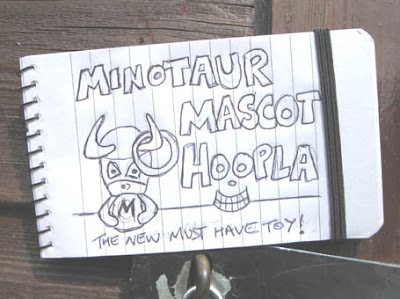 It’s a Minotaur Mascot Hoopla Game! I know, it is genius, isn’t it? And what’s more, I reckon it might actually be a seller! After all, what kid doesn’t play hoopla, right? I’d love to hear your thoughts on this invention and, if you’re interested in taking it further, I reckon I could put a working prototype together for a mere $1.5 million! Prof. Waldo P Wilkinson. Aged 104. 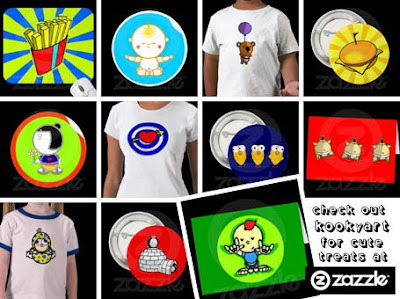 KookyArt is a fantastically fun Zazzle store that’s packed with all sorts of cute and happy designs - every one of them guaranteed to raise a smile. From penguins and pumpkins to birdies and bumble bees, KookyArt really is a shop after my very own heart. And with everything from t-shirts and mugs to stickers and badges, I’m sure you’re all going to love it too! Long live the fun! As someone who seems to be pretty adept at getting their own way, I thought you might be able to help with a problem I’m having. You see… next week I’ll be going on holiday with my dad and my seven brothers - and no, that isn’t typo! It isn’t that I don’t like my dad and my brothers but, being the only girl in the family, it does mean I am constantly outnumbered and outvoted when it comes to choosing holiday activities. And, even though they all seem to enjoy it, I find the prospect of spending the next six weeks hill walking, camping, and white water rafting an absolute drag! I’d much prefer shopping, sightseeing, and sunbathing any day of week! After all, aren’t holidays supposed to be about relaxing? Anyway, I was hoping you could give me some handy tips for getting my own way. For once! 1. Asking! As the old adage goes… “If you don’t ask, you don’t get!” Sometimes the key to getting what you want is to simply be upfront about it. Although most of the time, it isn’t! 3. Persistent moaning! Never underestimate the power of a good moan! Be relentless and consistent, and eventually your target will crack! That’s how I got my pet goldfish! Result! 4. Truth bending! a.k.a. lying! Your dad and your brothers can’t go white water rafting if the road to the river is closed. What? They didn’t hear about the avalanche? It was all over the news! Hee-hee-hee! See? Living proof that you’re never too old for a good old fashioned tantrum! And, as I’m sure you noticed, it also got her the result she was looking for! Just as it will for you! Well… as long as your dad and your brothers don’t read this too! Yes, you’ve guessed it! It is a kawaiified football! 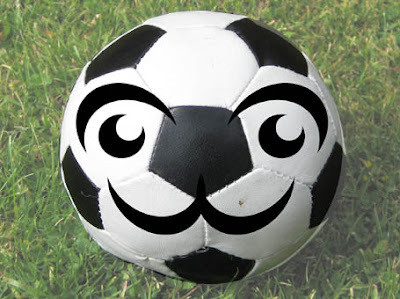 What better way to mark this fantastic tournament than to put a happy little face on a football! Just perfect! And with the summer sun now well and truly upon us, I eagerly look forward to a happy and prosperous few months of further kawaiified joy. Of which, needless to say, I fully intend to share the results with you and your wonderful readers. Amazing! Another bona fide classic! Your honour, your works of kawaiification just keep getting better and better! I can’t wait to see what you come up with next! 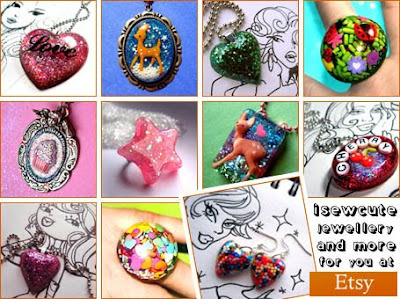 Isewcute is an Etsy shop that specialises in making cute resin jewellery. And, as I’m sure you can see for yourselves, the resulting goodies are a stunning, and sparkling, success! 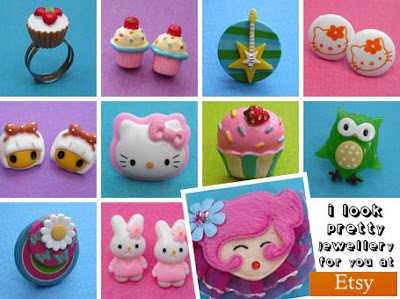 Packed with rings, bracelets, necklaces, and earrings, Isewcute is a dream come true for anyone who loves cutely crafted accessories. And, with the option of custom orders available, there really is no excuse for you not to treat yourself. Enjoy! OK readers, ready for a look at some cool t-shirts? Great! That is why I’m here, after all :) And today I’m going to show you some of the coolest, not to mention cutest, t-shirts I’ve seen in a long time. So sit back, make yourselves comfortable, take the phone off the hook, and get ready for a sweet slice of cute character clothing. Ladies and gentlemen, I present to you AAITSKI! See? I told you they were cool! At AAITSKI! you can pick up cute clothing for the whole family. And when I say the whole family, I mean the whole family! Catering for everyone from babies to grandparents, AAATSKI! truly have a t-shirt to suit, and fit, everybody! All you have to do is to work out who’s going to get which tee! Well? What are you waiting for?